Here at Barnes and Woodhouse, we’re used to creating all kinds of shipping crates for a number of different projects – however of late we have been lucky enough to work with UK artists whose creations have been sought-after around the world. While exhibiting some of her willow sculptures at the RHS Chelsea Flower Show in 2013, Whitby-based artist Emma Stothard was commissioned by architects from the Singapore Gardens by the Bay to create two pairs of sculptures of Thoroughbred mares and their foals, one from willow and one from aluminium rods as part of celebrations for the 2014 Chinese Year of the Horse. 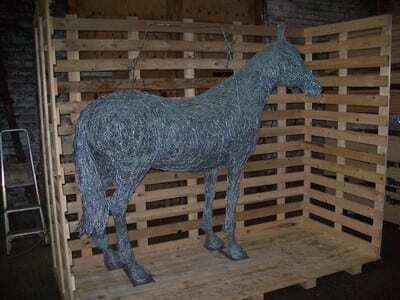 Metal sculptures are a relatively new area for Emma, who learned traditional willow weaving while living in Somerset, and has steadily increased the size of her creations over the years, now frequently producing horses and deer which can take up to six weeks to make. Emma’s menagerie of animal, fairy and human sculptures have appeared in a number of places in the UK, including Thirsk Racecourse where her willow-made stallion Warrior stands as a testament to the many horses who died during World War I. As a thank you to the Prince of Wales for the support she received from the Prince’s Trust, Emma created and presented a large-scale sculpture of his favourite dog Tigga which was made from the willow grown on Highgrove Estate and is sited there now. After spending months creating the two mares and two foals, it was vitally important that Emma’s beautiful designs made it to their destination in Singapore safely. The aluminium pair were galvanised before shipping to prevent future rusting, while the willow was heat treated to ISPM15 standards before sculpting and finished with Linseed oil and Turps. 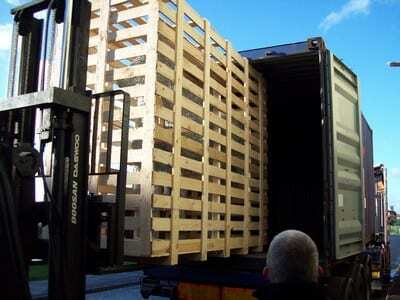 ISPM15 is an important standard as it ensures that no insects or diseases are brought into a new country, and all our packing crates are made to this standard – so it just made sense that the horse should too. 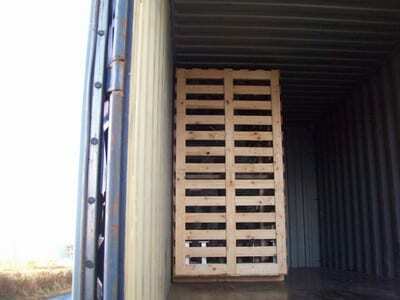 The actual design of the crate was made to the specification that custom officials would be able to see inside, so they were made as open-boarded crates and packed tightly in their pairs. 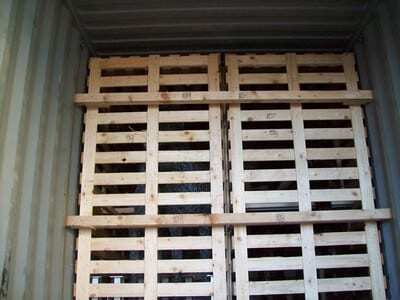 The crates were made so that both would fit perfectly side by side in the shipping container, eliminating the risk of jostling and damage to the artwork, and were filled with desiccant to absorb moisture and protect the pieces. 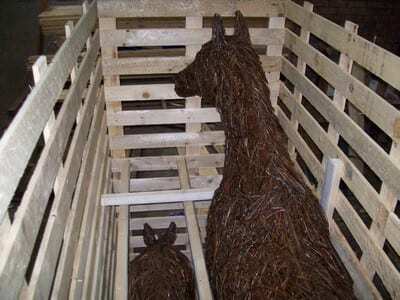 We made things as easy as possible for Emma by supervising the willow treatment, collecting the sculptures directly from her studio and providing her with plenty of photos of the crating process. After five weeks of travelling, the mares and foals arrived safely at their destination at the Singapore Gardens by the Bay, where they currently reside with a number of other horse sculptures from around the world in the Floral Dome.